If the video shown during the press conference is any indication, T-Mobile’s “G1 with Google” should give the iPhone a run for its money. Much was made during the press conference of the “totally open” platform (vs. Apple), though Apple wasn’t mentioned by any of the presenters. Here’s the press release. Although the features will be scrutinized and written about at length, one interesting item from the promotional video during the press conference appears to be a deeper integration of search into the mobile internet. It appears one can search from any page without launching a search app. There’s also a dedicated search button on the physical keyboard. The iPhone was only referred to by T-Mobile executives as “the device you mentioned” in response to a very indirect comparison raised by a member of the press. The phone isn’t compatible with iTunes and there’s currently no VoIP client other than Google Talk. Speaking of which, Google Talk will be integrated with the G1 phone book. The Amazon Music Store is pre-loaded into the phone. Take that iTunes! The G1 uses the open-source webkit browser (“Chrome light” according to Rubin). 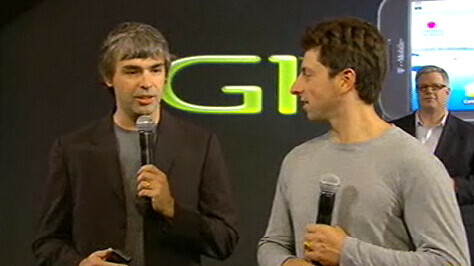 Larry Page and Sergey Brin made a surprise appearance. Brin mistakenly called the Android Marketplace the “[iTunes] apps store.” Page challenged the audience to do a mobile web search to test the speed of the device: “Computer-like functionality on a phone.” Page cites location based services as a great area of opportunity. And the press conference ends on a somewhat anti-climatic note. The phone looks very strong and very much like the iPhone mobile internet experience with perhaps a few additional bells and whistles. The iPhone was the “elephant in the room” and didn’t get direct discussion, although I’m sure it was on everyone’s minds. T-Mobile and the other executives present spoke about the G1 as though the iPhone didn’t exist, including Page (probably a T-Mobile request/strategy). It was very strange since Google has so directly benefited from the iPhone and heavily sung its praises in the past. However, Google is officially now an Apple competitor. Eric Schmidt may need to resign from the Apple board accordingly (my speculation). T-Mobile has priced the phone to undercut the iPhone. For more news about it, see the phone’s launch site. Postscript: The WSJ’s Walt Mossberg offers some initial impressions and says the G1 stacks up nicely vs. the iPhone.